Daisy Jones and The Six is a gripping novel about the whirlwind rise of an iconic 1970s rock group and their beautiful lead singer, revealing the mystery behind their infamous breakup. 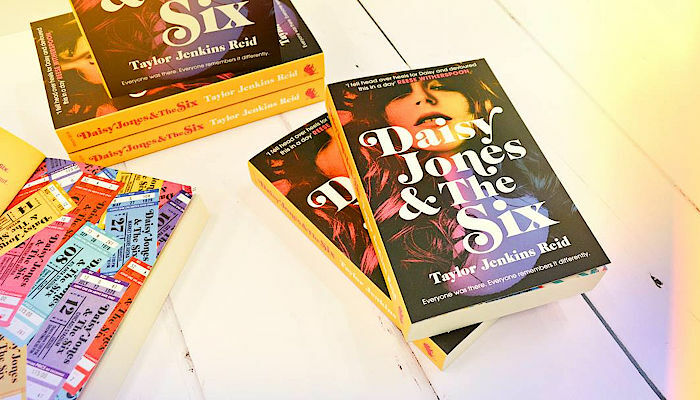 Taylor Jenkins Reid is a talented writer who takes her work to a new level with Daisy Jones and The Six, brilliantly capturing a place and time in an utterly distinctive voice. Daisy Jones was born in 1951 and grew up in the Hollywood Hills of Los Angeles, California. The daughter of Frank Jones, the well-known British painter, and Jeanne LeFevre, a French model, Daisy started to make a name for herself in the late sixties as a young teenager on the Sunset Strip. You’ve got a rich white girl, growing up in LA She’s gorgeous—even as a child. She has these stunning big blue eyes—dark, cobalt blue. One of my favourite anecdotes about her is that in the eighties a coloured-contact company actually created a shade called Daisy Blue. She’s got copper-red hair that is thick and wavy and … takes up so much space. And then her cheekbones almost seem swollen, that’s how defined they are. And she’s got an incredible voice that she doesn’t cultivate, never takes a lesson. She’s born with all the money in the world, access to whatever she wants—artists, drugs, clubs—anything and everything at her disposal. But she has no one. No siblings, no extended family in Los Angeles. Two parents who are so into their own world that they are all but indifferent to her existence. Although, they never shy away from making her pose for their artist friends. That’s why there are so many paintings and photos of Daisy as a child—the artists that came into that home saw Daisy Jones, saw how gorgeous she was, and wanted to capture her. It’s telling that there is no Frank Jones piece of Daisy. Her father is too busy with his male nudes to pay much attention to his daughter. And in general, Daisy spends her childhood rather alone. But she’s actually a very gregarious, outgoing kid—Daisy would often ask to get her hair cut just because she loved her hairdresser, she would ask neighbours if she could walk their dogs, there was even a family joke about the time Daisy tried to bake a birthday cake for the mailman. So this is a girl that desperately wants to connect. But there’s no one in her life who is truly interested in who she is, especially not her parents. And it really breaks her. But it is also how she grows up to become an icon. DAISY JONES (singer, Daisy Jones and The Six): I could walk down to the Strip from my house. I was about fourteen, sick of being stuck in the house, just looking for something to do. I wasn’t old enough to get into any of the bars and clubs but I went anyway. So I bummed a cigarette from this roadie outside the Whisky a Go Go one night—the first time I’d ever had one and I tried to pretend I did it all the time. I held the cough in my throat and what have you—and I was flirting with him the best I could. I’m embarrassed to think about it now, how clumsy I probably was. But eventually, some guy comes up to the roadie and says, ‘We gotta get inside and set up the amps.’ And he turns to me and says, ‘You coming?’ And that’s how I snuck into the Whisky for the first time. I got up, went out the next night, did the same thing. Eventually, the bouncers on the Strip recognised me and let me in wherever I was going. The Whisky, London Fog, the Riot House. No one cared how young I was.